Corolla Hatchback’s interior is inviting and exciting. Its premium look and feel starts with high gloss accents set against soft-touch materials, including piano black trim and available Softex seats. Automatic Air Conditioning is standard and comfortable sport front seats are designed to hold your body in a natural posture -- with pedals, controls, and available heated steering wheel all within easy, intuitive reach. Life’s waiting. The all-new Corolla Hatchback helps you experience its endless possibilities. To complement the comfortable sport seats up front, a rear bench offers seating for 3 more passengers, as well as anchors for child restraints. When more versatile transport is required, the 60/40 split-fold rear seats provide additional cargo storage, accessible from the hatchback. Live life to the fullest with the XSE Package. Elevate your style with the all-new sport fabric & SofTex interior, in Black or Saddle Tan. Enhance your comfort with 8-way power adjustable front driver seat and dual zone automatic air conditioning. And amplify your infotainment with Entune 3.0 Premium Audio which includes Embedded Navigation with a 6-month subscription to Destination Assist, integrated SiriusXMⓇ satellite radio, 7” TFT multi-information display with digital speedometer, and more. 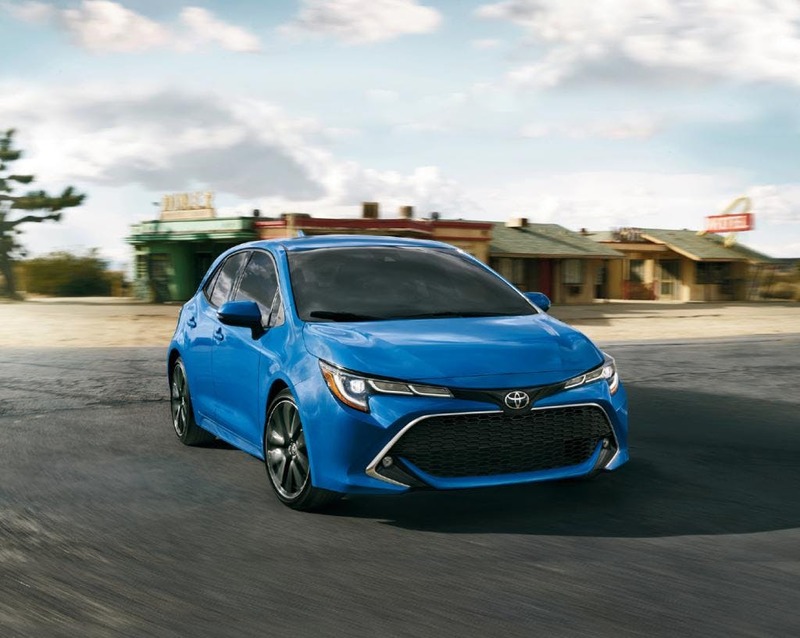 Corolla Hatchback SE Package fuses sporty styling and exciting driving dynamics with exceptional value. Features including leather wrapped steering wheel with paddle shifters, heated front seats, 16” aluminum alloy wheels, and rear bumper with chrome accent help you navigate your world in comfort and style. SE Upgrade adds 18” Alloy Wheels, heated steering wheel, wireless charging, and more. The Corolla Hatchback works with Apple CarPlay -- the smarter and easier way to use your iPhone while driving. Simply connect a compatible iPhone through a USB outlet, and select apps appear on your vehicle’s 8” touch screen. Using Siri voice commands, steering wheel audio controls, or the touch screen, you can make phone calls, send text messages, call up your favourite playlist, use maps to find the best route, and more -- all while keeping your focus on the road. EntuneTM 3.0 keeps you connected to the content that matters to you - with Entune App Suite’s Slacker, Yelp, Sports, Stocks, Fuel and NPR One apps, along with apps for weather and traffic incident news. Entune also features Scout GPS Link that employs navigation from your phone if the vehicle is not equipped with embedded navigation. 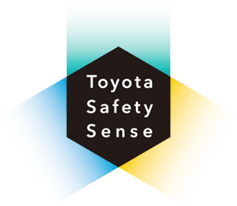 On XSE, EntuneTM 3.0 Premium Audio, enhances connectivity with embedded navigation, Destination Assist, and Safety Connect, so that you can take advantage of a Stolen Vehicle Locator, Emergency Assistance (SOS) button, Enhanced Roadside Assistance and Automatic Collision Notification. Comfort, confidence and control. The Corolla Hatchback is the complete package. Based on Toyota’s New Global Architecture, its low centre of gravity translates into dynamic handling. Coupled with exceptional body rigidity, multi-link rear suspension, and Active Cornering Assist, Hatch delivers a genuinely sporty drive with great feedback, quick response, and super stability. Power, exceptional fuel efficiency, and a lower carbon footprint -- Corolla Hatchback’s all-new Dynamic Force 2.0-litre inline 4-cylinder checks all the boxes. Equipped with advanced engine technology, including high-pressure direct-injection, Corolla Hatch generates an impressive 168 HP and asks only 6.7-litres (Automatic) and 7.5-litres (Manual) combined fuel efficiency per 100 km, all while reducing harmful emissions. Choose from two available transmissions, including a 6-speed iMT (Intelligent Manual Transmission) with downshift rev-matching for smoother and faster transitions between gears. Or an all-new Direct Shift-CVT with simulated 10-speed sequential shiftmatic steps, Sport Mode and available paddle shifters. Both offer enhanced fuel efficiency and fast-paced fun the moment you step on the gas. Electrifying in performance and personality, Corolla Hatchback also has a quieter side. An abundance of sound-absorbing materials, sealants, foams and silencers insulate the cabin from wind, road and engine noise. Drivetrain efficiencies, and rigid engine mounts further reduce powertrain intrusion. Aero Stabilizing Fins located on the taillights work to reduce wind drone. 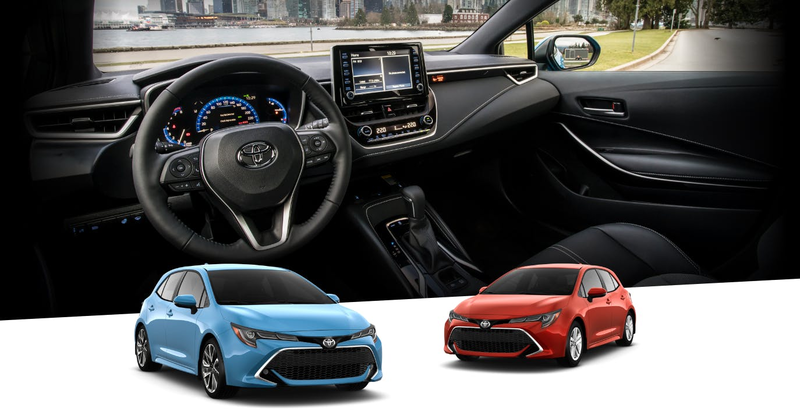 The all-new Corolla Hatchback is the first Toyota to feature TSS 2.0, an even more advanced suite of driver aids. Enhancements include pre-collision system (PCS) that’s better able to detect bicycles in daylight and pedestrians in low light. CVT models offer full-speed dynamic radar cruise control (DRCC), and Lane Tracing Assist (LTA) that can help keep your vehicle centred in its lane even in the temporary absence of lane markers.